Sandspit Amusement Park is PEI’s classic amusement park, complete with an old-fashioned carousel, cotton candy and tons of rides. Young ones can climb onto car racers, teens can try the tilt-a-whirl, and families can fly around the ferris wheel. The park is free to enter, and only those who want to ride the rides have to a) purchase a bracelet or b) purchase coupons and pay as you go. The free admission to the park allows you to come and go as you please. You can spend a few hours at the park in the morning, go off on another Island adventure in the afternoon, and come back later that night. The lights on all the rides transform the park into a whole other experience at night, it’s like whole new park. If you are planning on spending a few hours, the bracelet is definitely the best value. What does the Sandspit bracelet include? The Sandspit bracelet is a powerful talisman of fun. There are a few things to know about what the bracelet includes, and what it doesn’t. 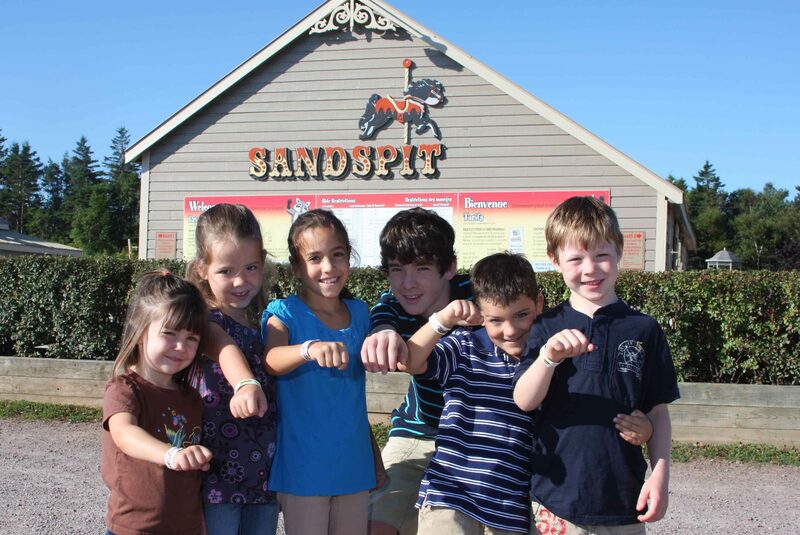 The Sandspit bracelet includes all the rides, except the go-karts and the games. There are height restrictions on each ride. Check the Sandspit website for the height restrictions. The kiddie rides – the Sky Flyers, Kiddie Cars and the Mini Cyclone – are for those under 36” tall to 48” tall. The Helicopters and Carousel are perfect for all heights. For the thrillseeker, there is the Cyclone, the largest roller coaster in Atlantic Canada, the 70 foot Ferris Wheel, the Paratrooper, Tilt-a-Whirl, Scrambler, and my personal favorite, the Cliffhanger. Why is the Cliffhanger my favourite, you ask? I love the feeling of weightlessness, the exhilaration of the height, and the unexpected drops. G-force is super fun, folks. There are ride options for the whole family included in the bracelet as well. These are the ones that parents or older siblings over 48” can accompany children between 36” to 48” tall. Rides like the bumper boats, bumper cars, the Landslide, miniature golf, and the Sandspit Railway are also fun family options. Miniature Golf at Sandspit is great for all ages. In the interest of safety, unlimited go-kart rides are not included in the Sandspit bracelet. Confidence increases with each trip around the track, and extra confidence can lead to riskier driving, which has the potential to lead to an accident. Limiting the number of times that someone will ride the go-karts keeps the track safer. Sandspit has a selection of carnival games, and an arcade room, which is pay-as-you-go, and not included in the bracelet. Did the frog make it in? Tip: Sandspit makes a perfect location for date night, show off your skills and win your date a stuffed toy! What if you have a hand-held baby? 1. If your child under 36” will not be riding the rides, ie an infant, and there is no need for a bracelet, you can ask for a special sticker at the front entrance for your child. This special sticker will allow your child to ride the train, carousel, and helicopters with you, provided you have a bracelet. 2. If your child under 36” is going to ride the rides, and has a bracelet, and you don’t, you can accompany your child on the train, carousel and helicopter, provided you get a special sticker at the front entrance. Accompany a child under 36″ on the carousel. A day, or night (or both!) at Sandspit, is a fun family attraction. Kids will want to go on ride after ride, again and again. Cotton candy, sno-cones and that bracelet will be keeping them going for a while. The benefit of the compact footprint of the park is that when you need a break after a few rides, you can find a spot in the shade, and let the kids keep going. This is a perfect opportunity to get an ice cream or popcorn for yourself! Have fun! Jessica Caseley is Maritime Fun Group's VP of Marketing, Sales and Community Engagement. She can usually be found connected to at least two devices at any point during the day, except when she puts her phone down to eat her favorite hamburger (The Anchor Burger from The Ship's Company) or a BeaverTail (maple flavor, light on the chocolate).